Chimney Repairs. Costs, How-To, and Other Questions Answered. Chimney repair questions answered, by a Saint Louis Tuckpointing Company. Atek. One of the most common tuckpointing repairs needed in the St. Louis area is Chimney tuck-pointing. Water comes in at the chimney on the roof or somewhere along the chimney breast, making it’s way to your walls or ceiling. Chimneys are often the most weather exposed part of any home. They sit higher than any other part of the house getting every bit of every part of weather from excessive rain, snow, and ice, to excessive sun and wind. These all play a major role in the rapid deterioration of any chimney. When water enters and makes it’s way through the brick at your chimney, it can cause costly damages to your paint, drywall/plaster and trim in the area being saturated. Most people do not even realize their chimney is in need of tuckpointing until they notice the water entry. You can avoid the expensive damages by keeping up on the maintenance of your brick or stone chimney. Once a year, do a visual inspection of the chimney, from the roof if possible. If you notice failing mortar joints(Cracks, small holes in the mortar) or a cracked mortar cap, It’s time to have the chimney tuckpointed or repaired. If the damage is worse (Many missing mortar joints, deep holes/cracks and broken brick) you may already have water entering and not know it. Get any necessary chimney repairs done Before the water makes it way through your brick causing further damage. How the chimney is repaired. More often than not, we recommend a complete overhaul on the chimney when doing chimney repair work. Steps listed below. We tuck-point the entire chimney solid (usually from the roof line up, sometimes more/less). Repair/replace missing, loose & deteriorated brick. Repair/replace the mortar/concrete chimney cap (crown wash), & install bird-cage on flue if needed. Inspect flashing, repair/replace as needed. Caulk the flashing around the chimney. 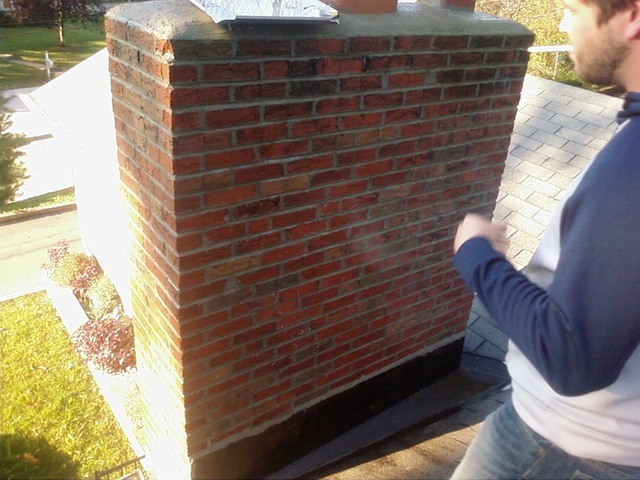 And Finally, Apply masonry cleaner and sealer to leave your chimney looking and performing like new again. Each chimney has it’s own unique problems, which can be assessed by giving us a call for a free estimate. Schedule a meeting with us and we will outline your specific needs to get everything back in tip-top shape. What Does Tuckpointing a Chimney Cost? Your average 1 story house with a brick chimney job is going to range from $300-$1000 for a complete overhaul, depending mostly on size and ease of access. A chimney on 2-3 story houses can sometimes be extremely hard to get to depending on the pitch of the roof, obstacle(s) around set up area and height/size of chimney. Prices vary even more for these types of jobs ranging anywhere from $400-$2000+, again depending on factors listed above. We’ve worked on every type of chimney job the greater St. Louis area has to offer, whether it be brick or stone, 1-15 stories high, small and large projects alike. If there’s a chimney repair problem you need help with, give us a call, we would be glad to help. Posted in Chimney Restoration and Repair, Company Information: Estimates, Costs & Prices, St. Louis Tuckpointing & Brick Repair, Tuckpointing, pointing, re-pointing. Mortar joint Repairs and tagged Brick, bricks, building material, cement, Chimney, chimney tuckpointing, chimny, company, cost of chimney repair, good tuckpointing, how, how long, how much does chimney repair cost, mortar color chart, mortar colors, repair, Restoration, St. Louis, tuckpointing on January 31, 2013 by Jacob Thompson.